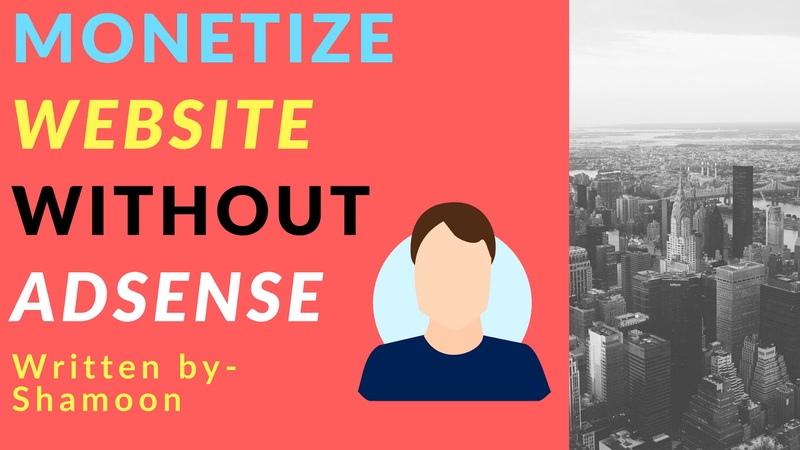 Hello friends today i am going to tell you about ad networks how to monetize website without Adsense.You know adsense is a biggest adnetwork and its a google product thats why its populer because google have more traffic than other and google have public trust thats why we trust on adsense and 99% bloggers and website owners use google adsense 1% blogger use another adnetworks mostly bloggers use adsene and media.net so now lets talk about - Monetize website without adsense Strategies For Beginners. What would you go if adsense died you will will go on other adnetworks like media.net , infolinks and more you know mostly bloggers use adsense because we trust on google and google products adsense is a google product and adsene is a no1 ad network in the world adsense pays more money if you see other ad networks you ses their very low RPM , CPM , CPC etc but in adsense you see high rates but some adnetworks are also pay you high rates like-media.net etc. Also read: Can Bloggers Make Money Without Adsense? Adsense is a biggest ad network in the world Adsense pays high rates thats why we use it and its a google product you know mostly person trust on google i also trust on google but on internet world here is more search engines and more sites on which we trust like - Yahoo and Bing before some years mostly person had used Yahoo and Bing search engine we also trust on Yahoo and Bing but now google is a biggest search engine and its secure thats why i trust it and love google products and main reason is Adsense pay high rates of CPC , RPM etc Are you love google adsense comment on below. Media.net-This ad network is a best Adsense alternative its a bing and yahoo ads network minimum payouts is $100 after Adsense i will suggest you Media.net but in Media.net you cant see your reports impressions and money you can see but after 2 or 3 business days because its works delay but you can trust it because its a Yahoo and Bing product and Yahoo and Bing is also trusted search engines before some years mostly person had used Yhaoo and Bing so its secure and you can trust it its rates are high paying after adsense. Vidvertisers-So this platform is for populer sites if your site have organic traffic and populer so this adnetwork is very good for you but if you have not traffic so this platform is not for you because its require traffic. infolinks-So this is 6th largest adnetwork this platform is very nice because i used it and result was very good.so i suggest you for Infolinks. Chitika-its a medium ad netword not best but medium this is a trusted platform but this adnetworks CPC is very low in this ad network 1000 views= $5 so its a good thing you can try this but i suggets you Media.net and other. Propeller.com-its also a medium adnetwork its not a largets ad netowork like other but its CPC is not bad its good from other ad networks you can try this no traffic required. facebook audience network-its a very good and trusted platform and Facebook is a largest company so you can try it how it works- its works properly when you have more views on facebook and more followers so if you are thinking about facebook audience network so first you need a page and page views then it works properly facebook is a biggest company you know but if you use facebook audience network then you can not use another ad networks like media.net adsense etc you can only use facebook audience network its a big problem but some people use it because its a big platform and it pay high rates thats why some people use it i suggest you try it if adsense is not approving your site then you can use it. Media.net. Media.net is the best adsense alternative and yet i do not use it but i know its a trusted platform my friends use it and their earning is awesome some times Media.net pays $10 $15 RPM and this is minimum maxmimum is $100 , $120 so this is a great platform after adsense apply it if you want to monetize website with it. Media.net is a trusted platform its a Yahoo and Bing platfrom it is a big adnetwork in the world after adsense but mostly Indian people dont know about it because its a US platfrom i know google adsense is also US platform but google adsense is famous and media.net is also famous but in other countries not in India some people know about it in India and they using it on their site now media.net getting Indian people sites for approval because now media.net becoming famous in India you can use it and it pays high rates like adsense if we compare by adsense so some time media.net rates is high its a good platform i suggest you try it but you can not see your earning you need to wait for your earning show on media.net dashboard because it works delay your earning will show after 2 or 3 days. So friends these adnetworks are very populer and trusted you can try these and earn money after adsense i suggets you to use Media.net because its a trusted platform and best Adsense alternative you can try this but in media .net you cant see your reports minimum payouts is $100.And other adnetworks is good but not Like Adsense and Media.net.